Predicting our future by the practice with playing cards seems to become related to fairground booths and Gipsy fortune tellers. However, the original pack of the Playing Cards contains an illustrious and ancient history as an effective and potent oracle. 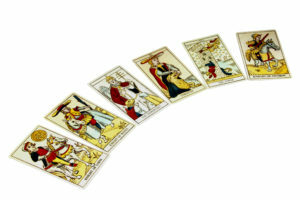 The common written guidelines and symbolism of the cards will give you their full meanings and spreads to do a reading. Explore them now! A long time ago, people used the cards to play games and foretell the future. Honestly, the cards were made for divination purposes. We together learn about simple methods, layouts, and basic meanings attached to every playing card. When you already know the meanings of these cards, you may select a spread that is accurate for you. You can also pick the one card out of a pack to receive a quick and easy understanding answer for your current issues if you want. Playing Cards have 4 suits: Hearts, Clubs, Spades, and Diamonds, and they get involved in 4 elements: water, air, fire, and earth. There are 13 cards in each suit, regarding the 13 lunar months per year. 52 cards are as to the 52 weeks per year. Hearts-Hearts are associated with the element of the Water. They represent love, relationships, happiness, and domestic concerns. They are known as happy cards. Clubs, the natural element associated with Clubs is Fire. They generally indicate ambition, business, and achievement issues. They exactly represent Success and Happiness. Diamonds, the element corresponding to Diamonds is Earth. They essentially signify financial issues and career. Spades, Spades are related to the natural element of Air, and eventually signify messages, upsets, and challenges. Fortune Telling Reading as simple or complicated as we please. * Draw one card for an instant and simple response to a burning question. A popular spread includes drawing 3 cards. The first card shows up the past, the second one shows the present and the final one indicates the issues of the future or outcomes. We can make a larger spread as searching for a background look for someone. With this way, draw 3 cards for each of the following topics: ourselves, our family, our buddies, what we expect, what we don’t expect, and outcome. Use our above topics to gain the accurate answers to our burning questions. Try to get predictions by Fortune Telling with Playing Cards right now! Most who actively participate playing card readings are into the act for the sheer passing the time value they boast to having, and do not exactly put that much stock into the predictions which they come up with. This is not exactly true. Those good playing card readings can actually help the seekers get the answers they are looking for if the seekers are themselves sincere and serious in asking the questions. Certain playing cards can also help seekers increase their intuition and psychic abilities. Ultimately, these are just tools, and if treated with respect and used with care, the seekers can gain a lot from using such tools.